Ok, so I received my CCA on 11/11 and I just found out that I passed the CPC today, so I'm a CPC-A. What order do I put them in after my name? Does it matter? Do I use the CPC-A first if I work for physicians and the CCA first if I work for a hospital? According to AHIMA, credentials should be ordered from general to specific. Not everyone employs this approach though, so you'll see people listing general credentials at the end of their name and then there is movement to sequence credentials "according to the order you received them." That does not match with other industries, but I see nurses using their BSN before their MSN and that's uncalled for and illogical. So, my suggestion is to sequence you CCA first, since it is more general. The CCA covers inpatient, outpatient and physician. The CPC is specific to physician, so it should be the second credential listed. Congrats! I hope this helps you some. I know that AHIMA has a certain sequence to follow for their credentials, but I didn't know how to list credentials from two different organizations. CCA, CPC-A looks better anyway LOL. 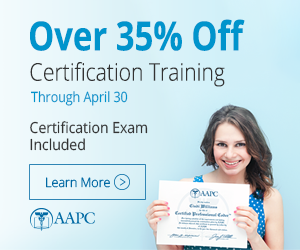 Got Your CPC Credential? Now Prep for CCS Credential also!